Wondering what to wear for the festivities on Thursday night? Why not try a little lace? Love these lace looks for New Year’s Eve and well into the new year! Lace can be extremely elegant and dressy, or can be worn as an overlay to more casual pieces, mixed with prints, or even printed on a tee or leggings. 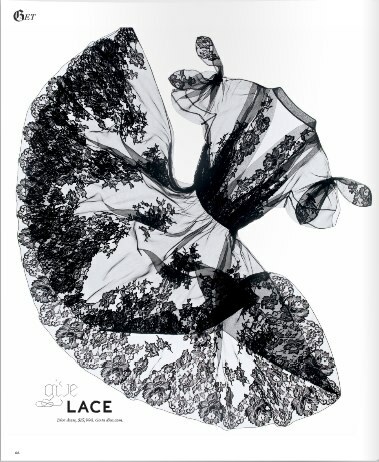 Have fun and get creative with lace, because anything goes on New Year’s Eve! Fantasy Dress: I have been dreaming about this stunning Dior dress ever since I thumbed through the New York Times Holiday 2009 issue of T Magazine. I imagine wearing this over a simple slip, complemented with lace-up boots. 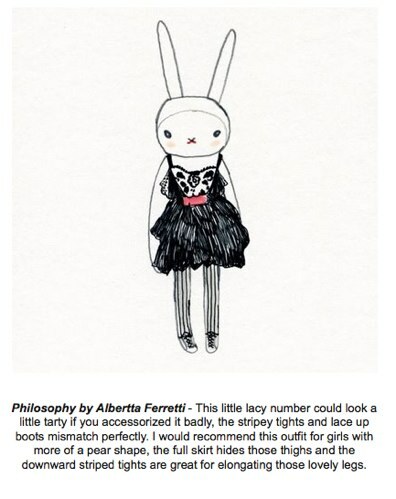 Much More Realistic: Why not try a cool alternative to a cocktail dress? Mix everyday basic pieces with touches of glam. Start with a solid basic tee (this one’s from Champion), add a faux fur DKNY hooded jacket, and add the gorgeous copper-threaded lace skirt by 3.1 Phillip Lim. Photo: Marie Claire, November 2009 issue. Provided you can still get some of the Rodarte for Target collection at your local store, check out this lace-on-lace action: Black lace cardigan over gray leopard sequin dress, black lace tights, and bow belt in leopard. Meow! I did see a lot of the collection still in my local target store. In fact, I picked up a navy blue lace tee (pretty!). Accessory Alert! Lace leggings and tights are everywhere! They look amazing worn under dresses, tunics and skirts. Lace-Ups: And lace doesn’t necessarily have to mean intricate or decorative fabric or trim. Consider lacing up a corset, some denim, or smokin’ hot boots. Ever day-dreamed of tapping out an online blog where you could write about all of your favorite things? 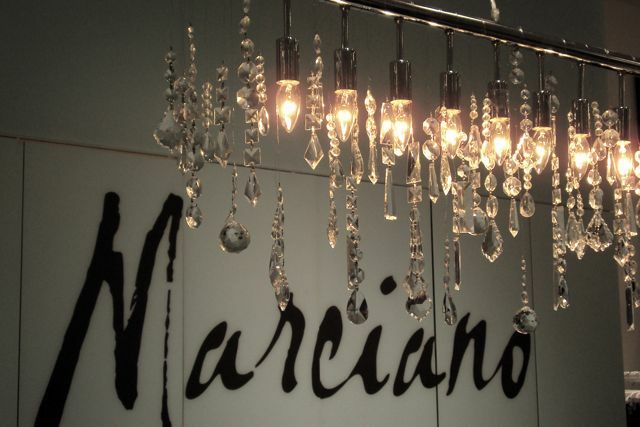 What about having that blog lead to fame, glamor, worldwide travel and your own line of shoes? Dallas’s own Jane Aldridge has done just that. If you’ve ever done a little clicking around online looking for fashion inspiration, you’ve surely already come across the 17-year old’s blog, Sea of Shoes, where she posts photos of her own styling ideas, inspirational fashion spreads, and of course, her unbelievable shoe collection. Jane’s blog has paved the way for some pretty amazing things that most of us will only keep day-dreaming about. It has led to her own shoe collaboration with Urban Outfitters. On top of that, Jane was recently recommended by Vogue to attend the Crillion Ball in Paris, where she wore Chanel Haute Couture, scoring a tour of Coco Chanel’s apartment after her fitting, and rubbed elbows with international debutantes. Last night Jane and Judy Aldridge hosted a festive event at Guess by Marciano benefiting Cook Children’s Medical Center in the Dallas Galleria. It was a sparkling event with hors d’oeuvres and cocktails, makeup touch ups and hair by Toni and Guy, lots of glamorous goodies to try on, and a swag bag containing a Swarovski crystal bejeweled December issue of Harper’s Bazaar! Swag!! 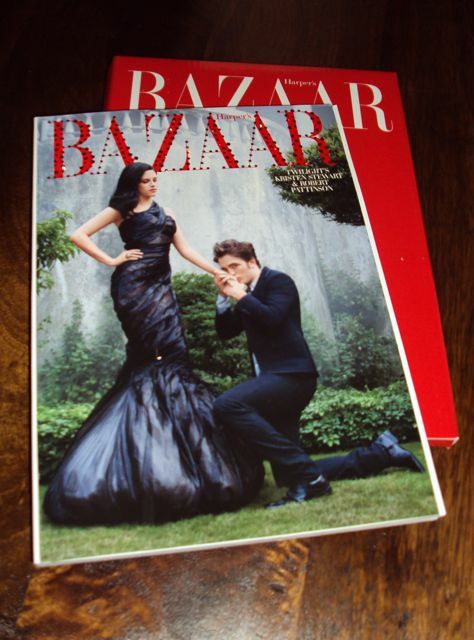 Swarovski crystal bejeweled Harper's Bazaar magazine with Twilight cover! 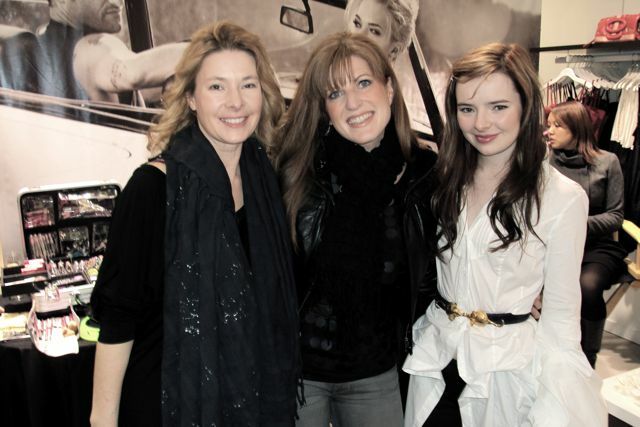 I enjoyed meeting and talking with Judy and Jane…we compared a few shopping and blogging notes. If these ladies are any indication of where a day-dream can lead, I’m definitely going to keep doing it! Who wants to go to this with me tomorrow? It’s at Southside on Lamar from 9am to 4pm. I can’t wait to see all the local goodness! The Dallas Flea. Click this for details. Look out, J. Lo! We know you love your Louboutins, but guess who got to spend an incredibly fashionable year in Paris with Christian Louboutin as her personal tour guide and fashion consultant? That’s right! Barbie (soooo jealous!). She’s had many makeovers in her lifetime (did you know that Barbie turned 50 this year? Remarkable! ), and this time she’s stepped up her style and stepped into the iconic red-soled world of Louboutins. Not only that, the buxom blond bombshell is now amazingly auburn! 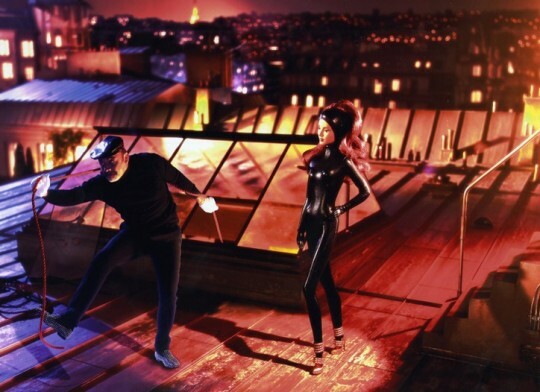 The limited edition ‘Cat Burglar’ doll is dressed in a black catsuit, and comes with a collection of 4 teeny-tiny red-soled Louboutins that are exact replicas of the full-size version, each with their own shoe box and signature red bag! Child’s play or not, I know exactly what’s going to go on many stylish gift lists this year.